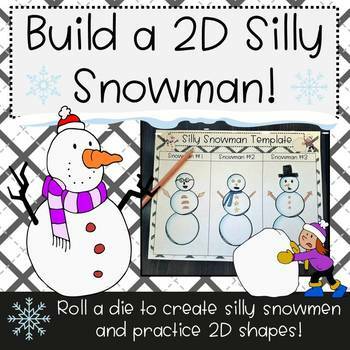 Build a Silly 2D Shape Snowman! 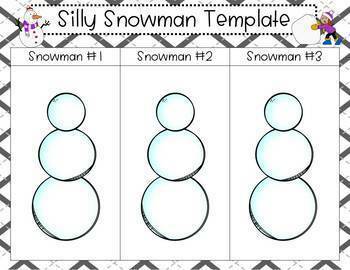 Create your own silly snowman using 2D shapes! This is a great NO PREP activity to practice 2D shapes while students have fun! 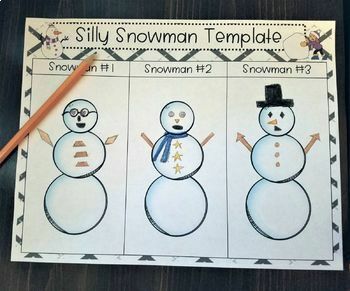 Print off the directions page, and a snowman template for each student. There is a small template for older students, and large template for younger students who need more space to draw the shapes. 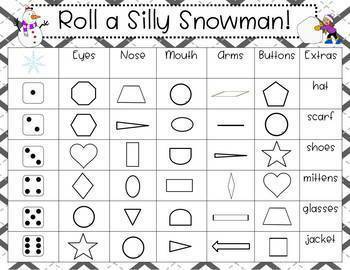 There is also a recording sheet for your students to record the shapes that they used to create their snowmen. a fun station for a winter party! -Student can read aloud their recording sheet to the class, and have the rest of the class try to copy their snowman from hearing the shapes. Directions: Students roll the die and draw the shape for the corresponding body part on their snowman. Add color! Be sure to follow my TpT store by clicking on the ‘Follow Me’ next to my Seller picture to receive notifications of new products and upcoming sales!